Being Human (US) : "A Funny Thing Happened on the Way to Me Killing You" - And we finally see the final episode of the US version of the show. And they manage to surprise at several turns. Oh, some of it turned out the way I expected, but that final fight between Herrick and Mitchell, er, Bishop and Aiden, was completely different for obvious reasons. Good stuff, and I'm looking forward to seeing more next season. Becoming Human : Adam, the teenage vampire from the UK Being Human, goes back to school and meets a werewolf in denial named Christa then a ghost named Matt who was murdered. I like the relationship between the characters, and I love the way this whole thing played out. A nice mystery, with room for a follow-up if they choose to do it. Doctor Who : "The Doctor's Wife" - The TARDIS arrives in a bubble dimension where strange things immediately start happening. After pondering last week's episode, I recognize that it had plot holes you could float a ship through, but I still enjoyed it at the time. This one seemed pretty tight plotwise, and was also very enjoyable. The title makes perfect sense in the context. 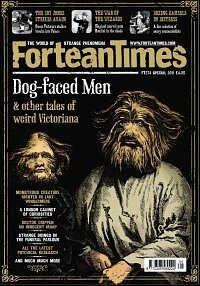 Fortean Times #274 (Special 2011). I don't mind this cover at all. Ambras Syndrome (hypertrichosis) isn't scary or too freaky, just a little unusual. Certainly better than swastikas. The image is from Illustrated Police News, a newspaper started in 1863 (and ran until 1938) that catered to the lowbrow tastes of the working class public. The four page article is actually less than a page and a half of text, but manages to be fairly interesting despite a lack of detail and a focus on sleepwalkers (four of the five images in the article are "somnambulists", the other is the cover image). However, this promises to be the first in a series of articles about the newspaper, so I'll forgive the faults and simply enjoy the oddity for now. Into the main mag... Strangedays starts with a lake monster. There is a report of another fish kill, this time a million or so sardines. A couple of reports of coincidence are fun to read about. Then we have a man with 12 fingers and 14 toes (with picture to prove it) and a baby born with two lower front teeth (again, with picture) whose mother has decided to bottle-feed. Reports of animals in the wrong place shows off pictures of racoons and kangaroos in Britain. Another article questions the guilt of Dr Crippen, famous in a 1910 murder case. A rather sickening collection of family members being locked up rounds out the strange news. The Science article tells us of a Victorian list of human vestigial organs, many of which aren't. For instance, the pineal and pituitary glands. Oops. Archaeology shows us a Tudor garden maze that was discovered via WWII Luftwaffe aerial spy photographs. Classical Corner is about faked works by well-known writers, going back to Thucydides and before. Alien Zoo has a follow-up about the giant heads and a mystery about a giant owl. Ghostwatch is about haunted funeral homes, and the lack thereof. Blasts from the Past is about lake monsters of Italy and Germany. The Random Dictionary is about Time Slips, with some interesting examples. Britain's X-Files covers the latest release of Ministry of Defense UFO files, and what's in them this time. There's a nice long article about Queen Victoria's stalker Edward "The Boy" Jones, and his adventures in the Palace. The sidebar to the article lists many other stalkers from old. The second part of last month's article about Otto Rahn and his search for the Holy Grail with the help of the Nazis fills six pages and would be more worthy of the cover feature than last month's part. The Forum has three articles, one about the preacher who claims the world will end on May 21st. The second article is about positive results in a psi test, using strict scientific methods, that either argues that science needs to change some of its methods or that psi is real. The implications are a little more far-reaching than it might sound but I wonder if it will result in any real changes? The third article hunts down facts about a couple of old sea yarns, and finds nothing substantial. The reviews were good, as usual, and a couple of books made it onto my wish and watch lists. The letters were solid, and the cartoon amusing, and I find myself already wishing and waiting for the next issue. "The Doctor's Wife"...well, I can't speak to plot holes, but I know I had fun. Some long-held suspicions in many quarters finally confirmed to the joy and consternation alike of many.